This website is designed to assist potential and current Matrix partners to understand and use the tool. Select the topics to utilize the site. The Family Development Matrix Project is successful at establishing a collaborative approach to assessment, case management and evaluation using shared outcome indicators. These agencies include Family Resource Centers, Child Welfare Alternative/Differential Response, First5 Family and Children Commissions, Head Start and pre-school education, tribal communities and other community based partners that serve families and children. The FDM has 350 indicators to document and analyze family outcomes. Additionally, the FDM provides measures of family engagement and the effect of interventions on family progress. A practice protocol facilitates the use of the FDM with paraprofessionals and licensed practitioners and accompanying training ensures reliability. One study examines the correlations between positive changes in FDM indicators and lower rates of subsequent child welfare referrals. 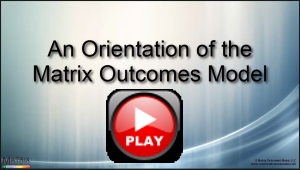 Studies are found at http://matrixoutcomesmodel.com/mainpublications.php.